About a week before my English Channel solo swim, I was already in Dover staying at the Channel swimming accommodation at Varne Ridge Holiday Park owned by David and Evelyn Frantzeskou (now fondly referred to as mum and dad). 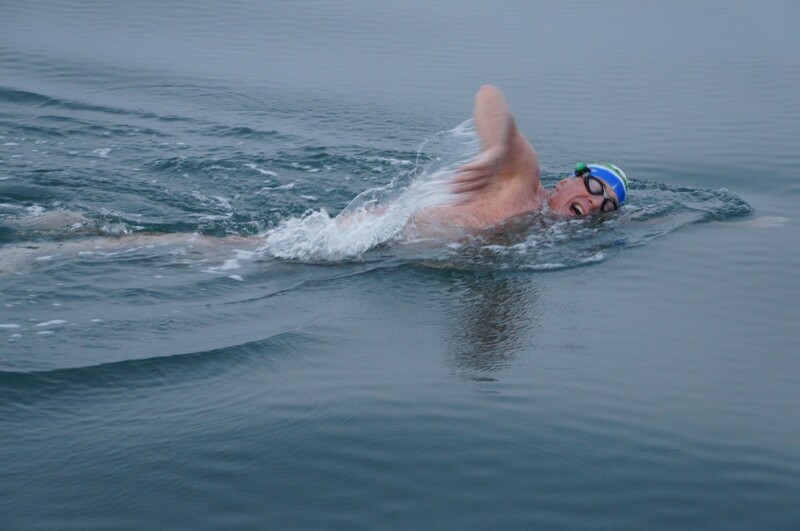 I prefer to train early, so I got up at 6am and went down to Dover Harbour and swam for an hour. Upon my return, I was standing by the Studio accommodation in the designated WiFi zone. This guy saunters down the driveway in just a pair of shorts! He introduces himself to me “hey, I’m Roger Finch, how you doing?”. We chatted for a bit and bumped into each other a few times over the next two days. Little did I know that I had just met someone who was not only going to be a dear friend of mine, but someone who has had a massive influence on my own swimming path. Fast forward eight months to the Sunday evening I’m cooking the family dinner. My phone pinged with a message. 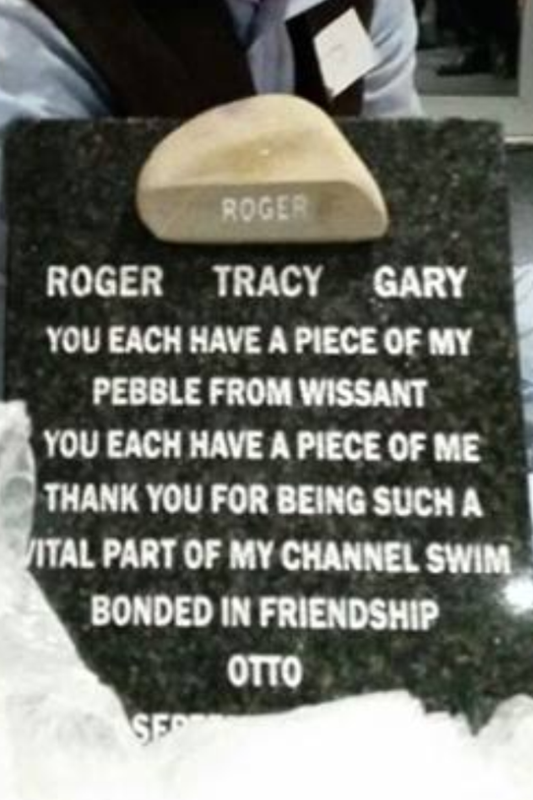 It was Roger asking if I would help him crew for his friend Otto who was attempting an English Channel solo swim in September that year (2014). I didn’t even hesitate…I responded with a “yes I would love to be a part of Otto’s crew. I have to ask though, why me?”. Roger responded with “I just know that you’re the right girl for the job”. I was very nervous…I had never crewed before…! I arrived in Dover on Thursday 4 September. Roger and I picked up where we had left off 8 months earlier. I have finally met someone who can talk more than me!! Saturday morning around 8am, Roger’s mobile went off. It was Otto. His boat pilot Mike Oram had just telephoned to say could we be ready in two hours! Otto’s swim was happening!! Roger was still lying in bed. Otto asked Roger what he thought. Without moving or even looking out the window, Roger said “sure Otto, let’s go for it. It’s a great day to swim”. I have to say I was a little shocked as Roger hadn’t even seen what the day was like, but I learnt a valuable lesson. Always trust your pilot! Roger and I flew around getting things ready. Thank you Sue Oldham for giving us so many of your supplies. Another valuable lesson learnt – you never know when you’re going to get the call to swim, so get prepared as soon as you get to Dover! We met down at the Dover Marina. I had met the charming Gary Bruce the night before. He was making up the third person of our crew. I liked him very much immediately. 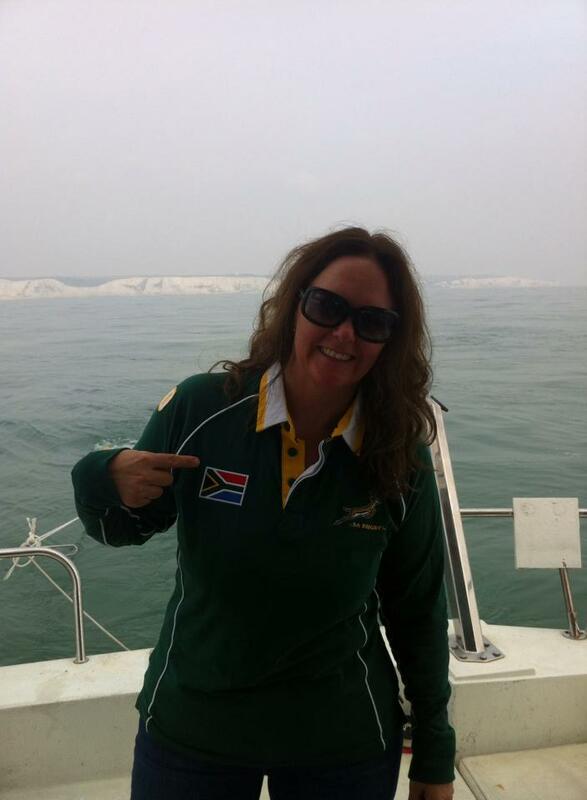 As Otto is from South Africa, I borrowed a South African rugby jersey in the name of camaraderie (and nearly lost my New Zealand passport in the process)! It was a STUNNING day on the English Channel. Dressed completely inappropriately in jeans and long sleeves, I roasted my way across the Channel! We established a great routine immediately. 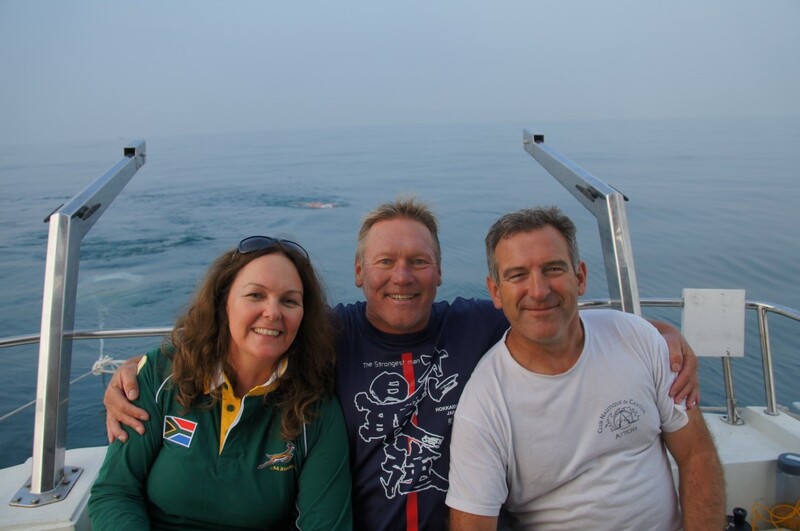 Basically, I was left to make the feeds, Gary was to deliver them via a feed reel to Otto every half an hour and Roger was his support swimmer and oversaw his friend…and made sure we were doing things correctly. 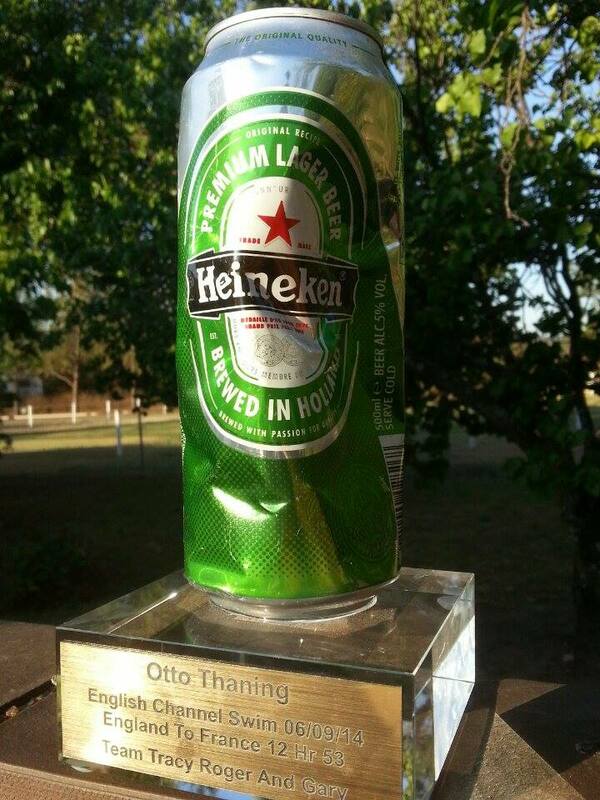 I was mesmerised by Otto’s effortless and graceful stroke! He averages around 44 strokes per minute and absolutely glides through the water. The Channel really behave herself and gave Otto flat conditions with a warm water temperature of 18-19 degrees Celsius the whole way across. Night fell and finally it was time for Roger to be Otto’s safety swimmer in to France. Priorities first though! Roger asked me to tie a mesh bag to his back with two cans of Heineken which I had brought over from Holland. Gary and I waited on the boat and watched as Roger swam Otto in. When Otto eventually stood up, we heard Otto almost roar from deep within…the only way I can describe it! We watched him stagger to the beach, then these two wonderful friends, the odd couple, hugged!!! I had tears dripping off my chin. Roger pulled out the beers only to open one and have the tab break on him. He smashed it against the rocks a few times. They shared the other beer in celebration. Roger and Otto swam back to the boat. Gary and I helped Otto get dry and dressed first. Roger pulled out the battered and damaged Heineken can and said to me “don’t throw this away, I have plans for this can”. Roger was so relieved and elated at the same time. 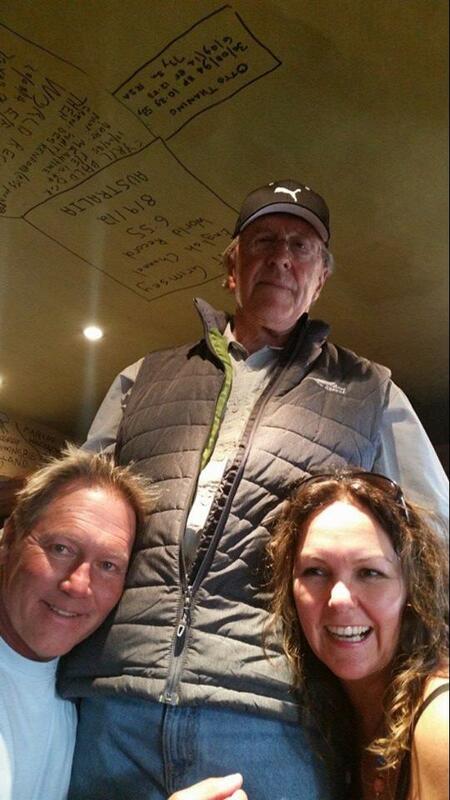 This was the third year in a row Roger had come to Dover to support his friend. This swim for me was life changing. Not only did I make dear friends for life but my drive and passion for this amazing sport was reignited. My shoulder was just starting to recover! Your swim Otto, got me thinking about future goals and possibilities. Thank you my friend, and thank you Roger for believing I was the right girl for the job! * Otto also swam the English Channel at the age of 53 in an incredible time of 10 hours 29 minutes.